As an Affiliate Marketer life can be hard. With limited resources you have to be a web developer, a marketer, an analyst and a relationship manager. You are at the mercy of the next algorithm change, cookie law or ad network terms change. Even when you are on top of everything you still have a hard time knowing exactly how profitable your business is. How much is traffic acquisition costing? How much is each network/ merchant delivering in commissions? Am I spending time and money on the right products or am I promoting duds? Is most my traffic just window shopping? AffClicks can answer these questions for you and more. With a quick setup much of you analysis workflow can be automated, allowing you to spend more time focusing on growing your business and less on crunching the numbers. AffClicks has moved into the beta testing phase, to register your interest head to affclicks.com and enter your email address. We are restricting invites to allow us to gently increase capacity and avoid any crunch. Generally though it should be a short wait from the time you provide your email. If you wish to keep updated on progress but don’t want to participate at this stage enter your email and we will be happy to keep you informed. Automated affiliate network reporting - Once you have setup your networks and the automated reporting for them you no longer have worry about constantly checking individual network stats again. Transaction listings and commission totals will always be up to date. Our current list of supported networks is: Affiliate Window, Commission Junction, Web Gains, TradeDoubler, Paid On Results, Affiliate Future, Zanox, Buy.At, AdTraction, LinkShare, Commission Monster, Clix Galore, DGM and Digital Leads Network. Some of the networks on the list for inclusion next are: The Google Affiliate Network, EBay, Amazon Associates, ClickBank, ShareASale, Commission Factory, AffiliNet and TradeTracker. We will also be including the Adsense network for Ad revenues, this isn’t the same model as affiliate networks but an important part of many Affiliate Marketers revenues. We are flexible on which networks get integrated and in what order depending on user demand. Let us know what networks you are interested in and we will be happy to accommodate. 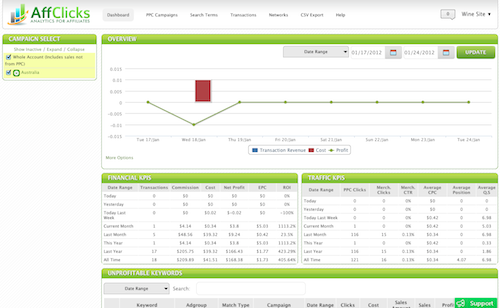 Automated Adwords Reporting - AffClicks is fully integrated into Adwords, which allows you to both automatically download reports and manage your account from within AffClicks. The Adwords interface can be a confusing at times and isn’t at all suited to Affiliates as it doesn’t record your commission earnings. AffClicks solves this problem. Quickly identify actionable changes - The faster you can find out which things aren’t working, the faster you can make changes to improve your business. For example, seeing that an Adwords Ad is sending traffic to your site that is either not clicking through to a merchant or making it to a merchant but not generating any commission on the merchants site. This is costing you but delivering low returns. Conversely you could see an Ad working really well and want to increase your bids on keywords that trigger that Ad to improve your Ads position in search results and send more traffic. Another scenario example is when you have two or more merchants selling similar or even identical products. The amount of traffic you send should be dependent on how each merchant is converting the traffic you are sending. This is easy to see and compare across networks in AffClicks. Attributing Sales/ Leads Back To User Actions And Search Terms - When you do receive commission, often you will want to know as much about a sale/ lead as possible, questions such as: How did the customer find us? What actions did they take on our website? Which merchants did they click through to? You may want to check later on and see which search terms are turning a profit so you can focus your SEO effort on the pages that are converting well. You also may choose to add search terms which have resulted in commission to an Adwords campaign to drive more traffic to these terms. More information is available on the website. We hope to see you involved in AffClicks either in beta or down the track when we launch publicly. We wish you all the best in your Affiliate businesses in 2012 and promise to do everything we can to make it your best year yet.